WPadverts offers add-ons with useful additional features. Every add-on comes with at least 3 licenses for 3 different websites. We have tested the add-ons below and we were surprised to discover that they added professional grade features. We didn’t find any bugs and we didn’t encounter any problems with the add-ons below. This add-on connects WP-adverts to Woocommerce. It means that classified ad payment will appear under the form of products in Woocommerce. On the woocommerce product page, in the settings, WPadvert will appear in the list of product type (simple product, variable product…). Then, the list of products will appear on the classified ad purchase page. This plugin is ad-free because it allows adding all the features from woocommerce like additional payment gateways (paddle, 2checkout, Sage). It also helps to use order confirmation from Woocommerce after a purchase and generate PDF invoices. This is the add-on which allows to charge classified ads and get paid using the standard PayPal gateway. This add-on adds a location taxonomy to wordpress; it is like a new list of categories. This adds a drop-down menu to the classified ad creation page in which the user can select a location. The location text will be added in the listings and also on the classified ad page. The downside about this system is that the webmaster has to enter manually all the locations. There is also another option to connect WPadvert to google maps so that you embed a google map window in the classified ad page. Don’t forget that google map isn’t free for heavy users. It helps to find a classified ad according to a radius search (example: all the classified ads in a 20 miles radius). This add-on allows adding a fee per category. Usually, if there are 3 prices (1 day, 15 days, 30 days), this is for all the classified ads. This technique is used by Craiglist which allows ad-free posting for many categories and different prices according to a category. This includes recaptcha in wpadverts to avoid spammers and spams. Thanks to this add-on the admin can modify the template of ad creation, search ads and contact form. You can remove, modify and add fields as you wish. 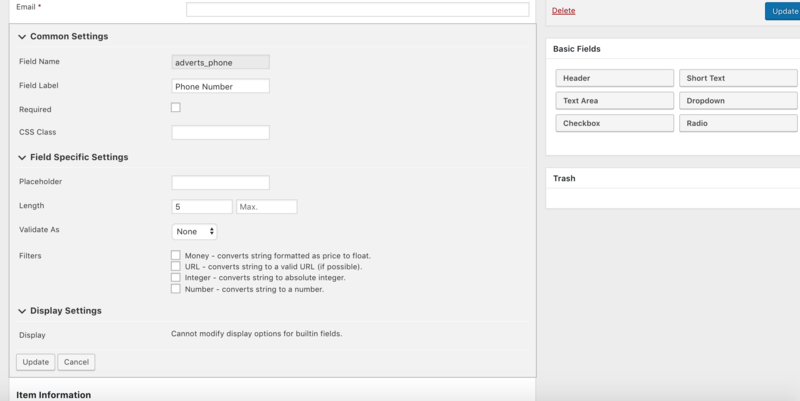 For example, you can remove the phone number field from the ad creation form. Thanks to this add-on you can customize the “search ads” form from WPadverts.